Group 3 of the Northern Area Auxiliary Unit Patrols consisted of Leavening, Westow and Wharram Patrols. 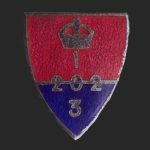 No 3 Group was commanded by Lt Robert Sisterton JCMF//1/4 who was born on 12/11/1909. He is described as a Vermin Destroyer and lived at Settrington. The Group Sgt Clerk was Sgt George Edwin Robson JCMH/81/1 of Settrington born 14/06/1912 and was a Porter/Signalman. Pte WD Cook later joined the RAF and saw service overseas. The first Patrol Sgt had been Sgt Wilfred E Parker and the original Cpl was Herbert Spenceley. Cpl Spenceley is listed in the Nominal Rolls as a Sgt Herbert Spenceley JCMA/1/4. There is no record of Wilfred Parker.